All-Area Softball Player of the Year Edinburg High junior pitcher Erika Cortez poses at Edinburg Vela High School on Tuesday, June 5, 2018, in Edinburg. 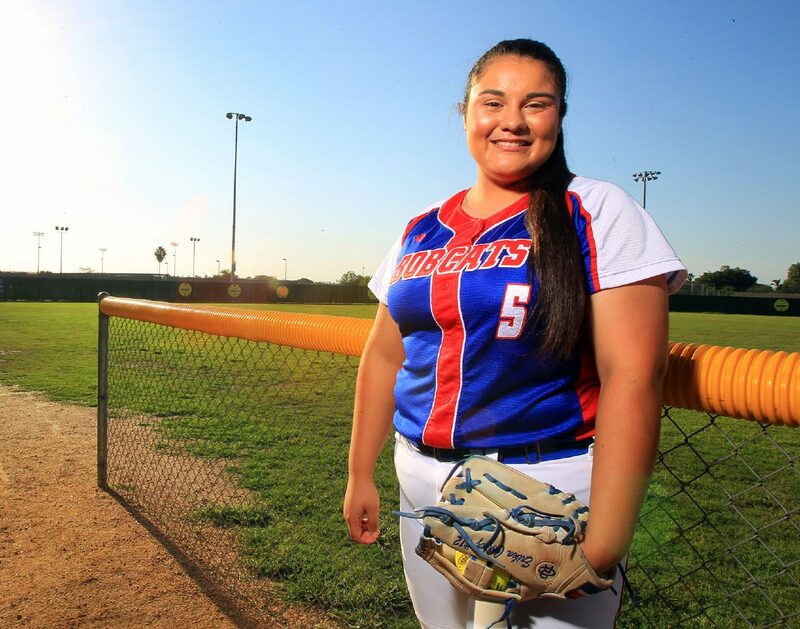 Edinburg High junior Erika Cortez is The Monitor’s All-Area Softball Player of the Year. EDINBURG — Last August, Erika Cortez participated in USA Elite Select’s second annual Select 30 All-American Camp in Baton Rouge, Louisiana. The three-day event hosted the best softball players from 40 states in five different age groups: the Class of 2018-19, 2020, 2021, 2022 and 2023. The first two days are an evaluation period for the near hundred players in Cortez’s age group. Athletes train with current softball players from LSU as well as professionals in the National Pro Fastpitch Championship Series on the fundamentals of the game. If the camp’s Select 30 task force deems a player good enough, she will be one of 30 girls to play in Day Three’s exhibition games. Cortez made the top 30, earning All-American camp status. Because the camp took place right before the school year began, Cortez missed the first day of her junior year at Edinburg High. Cortez came to EHS from San Benito. In 2016, she took the Valley by storm. Cortez was a perfect 12-0 in the circle with a 1.77 earned run average while slugging nine home runs as a freshman. Her Edinburg High experience turned once she took part in the softball athletic period. The addition of Cortez made what was already a stacked Bobcats team even better. EHS featured outfielder Katy Truitt, a verbal commit to Lehigh University; shortstop Maya Zavala, a verbal commit to Texas Southern and outfielder/pitcher Amber Reyes, who is set to play for Texas A&M-Kingsville next year. Cortez herself is a verbal commit to the University of Texas at San Antonio and proved as much in her first year wearing red, white and blue. She went 15-4 with a 1.74 ERA, struck out 132 batters and walked only 26 in 121 innings. Cortez also hit .541 with 17 doubles, 10 home runs and a team-high 64 RBIs to earn The Monitor’s All-Area Player of the Year honors. Ramon Arciba now has the privilege of coaching the All-Area Player of the Year for the second time in two seasons as Bobcats coach. Reyes was The Monitor’s All-Area Player of the Year in 2017. Despite a powerful offense, experienced starting pitching and a district championship, the Bobcats (28-8, 13-1) dropped two of three against Eagle Pass in the area round of the playoffs. The loss wasn’t made any easier when District 31-6A’s No. 2 team and Edinburg High’s crosstown rival Edinburg Vela went to the UIL regional semifinals for the first time in its history. Vela and Edinburg North are now the two schools in the ultracompetitive city of Edinburg to advance four rounds deep in the playoffs since 2016. In the eyes of Cortez and the program, 2019 will be a year for Edinburg High to complete some unfinished business.